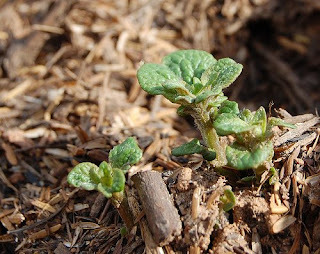 The potato plants are beginning to show their green fingers through the soil but there is little else to report in the garden. The raised beds look somewhat neglected and even the fledgling chilli plants have been scorched by the heat of the April sun. More time must be invested in the garden this weekend and even the children will be employed in the necessary weeding and digging and seed sowing. It’s the hottest April on record, so says Jonathan Ross. What does he know? He knows nothing of the termoil of the foodie gardener; slugs, water shortages, cold snaps, poor quality seed, cat poo. The ‘3-week’ salad leaves have taken at least two months to mobilise due to the chills of March and are now parched. No wonder Tesco is taking £billion every week. All of the grow-your-own community is starving with hope. Having said that, Tesco’s offer on Charlotte potatoes is too good to ignore and they shall be enjoyed with poached white fish and oily chirizo this evening. These spuds will have to bridge the gap between Easter and early July when our own salad potatoes will be ready for harvest. What are you planting and eating?